No makeover is complete and perfect without a graceful yet stylish hairstyle. Especially when it comes to the wedding, beautiful hairstyles make the brides look magnificent in their fancy apparels. 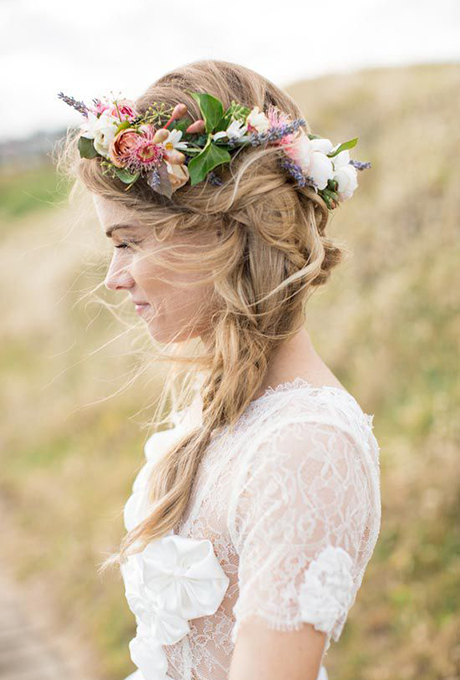 So here we present you the best of the 20 Bridal Braided Hairstyles with flowers and tiaras. 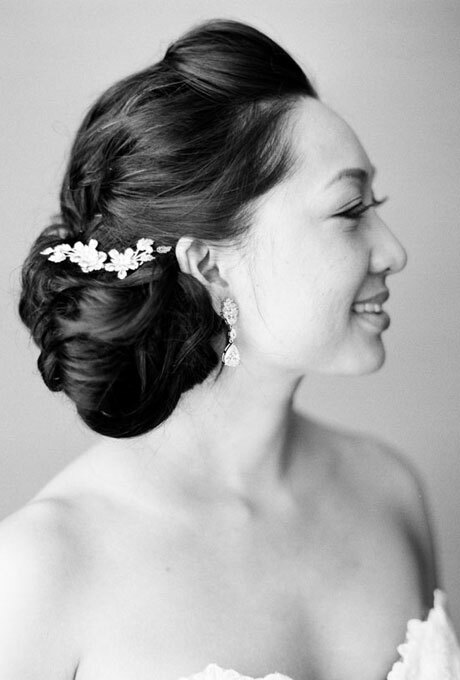 These are western style hairdo’s that surely going to enhance the outlook of the bride. Even the bridesmaid can carry them to look all fabulous. 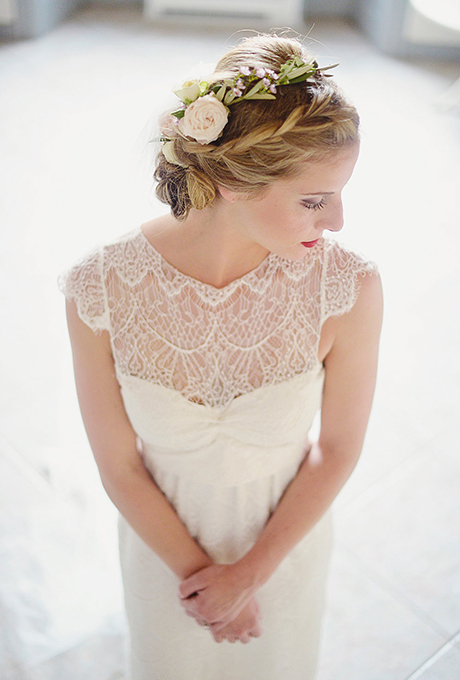 Here we have gathered the 20’s best hairdos for brides to follow on their big day. I hope you will love these amazing styles and ideas. 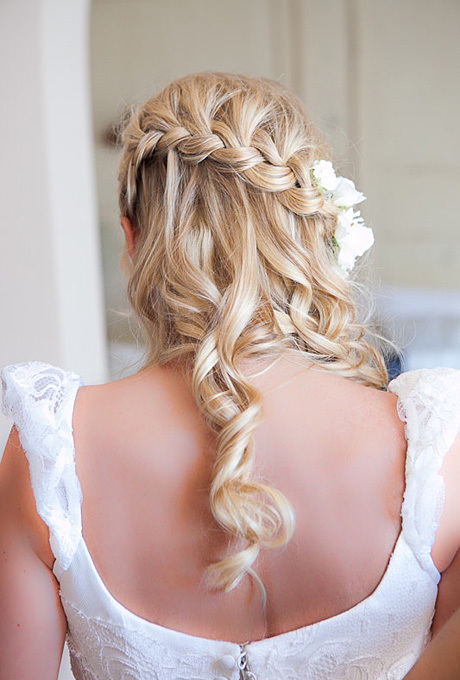 Brides with curly and wavy hair can try this lovely half hair locked with beautiful braids. It is a half-up style with the curly locks at the end. 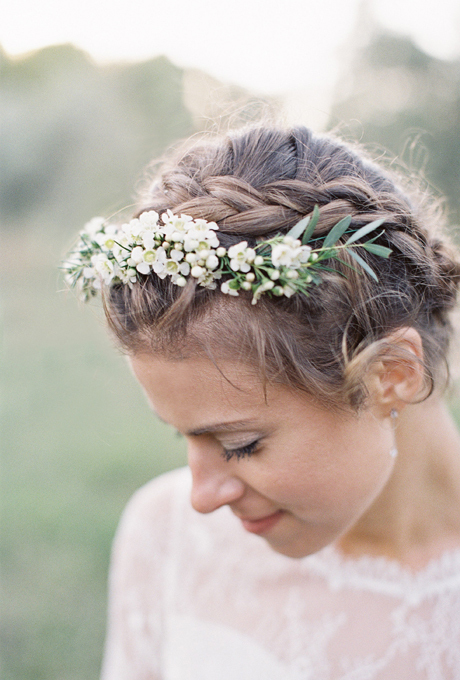 You can use any of the beautiful delicate flowers playing as the crown over the thick braid. This style looks equally good on silky straight hairs. 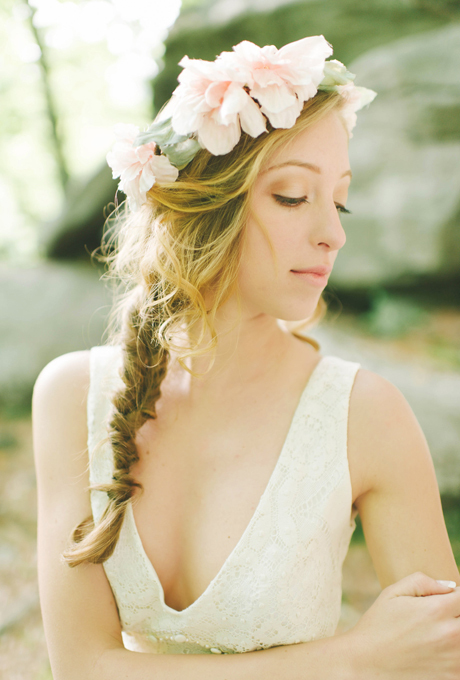 Fishtails with loose curls bring a style and balances the lovely white headpiece of the bride. Get yourself a glamorous and glitzy appearance with a nice headband with small flower crown or a hairclip. Shine up your braid in style. 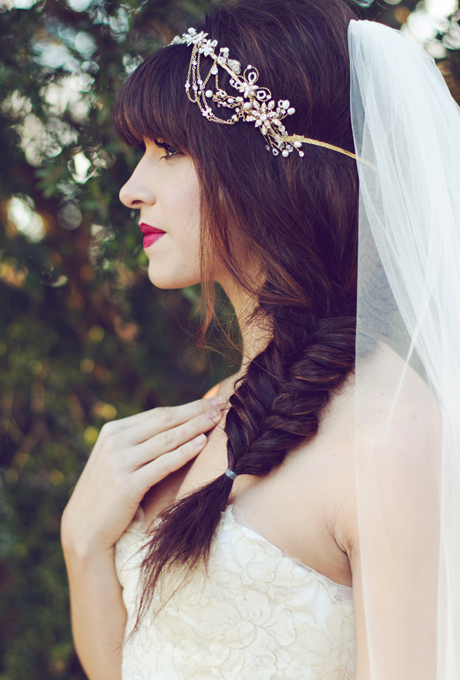 A lovely braided crown is loved by all women for their wedding. 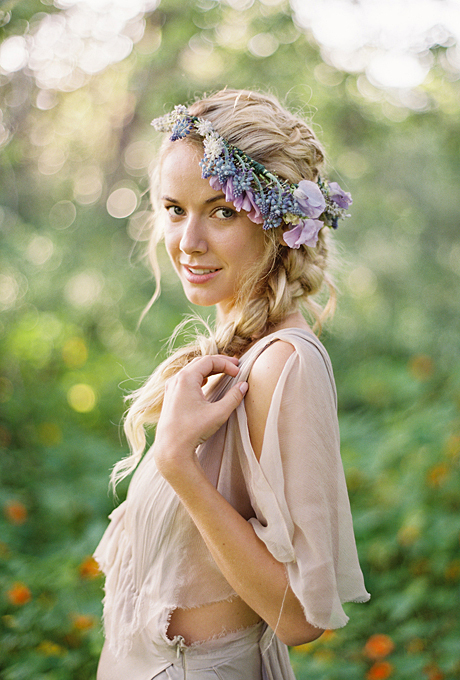 Either it’s spring or summer, these braided crowns look perfect with the bridal white crystal crown. 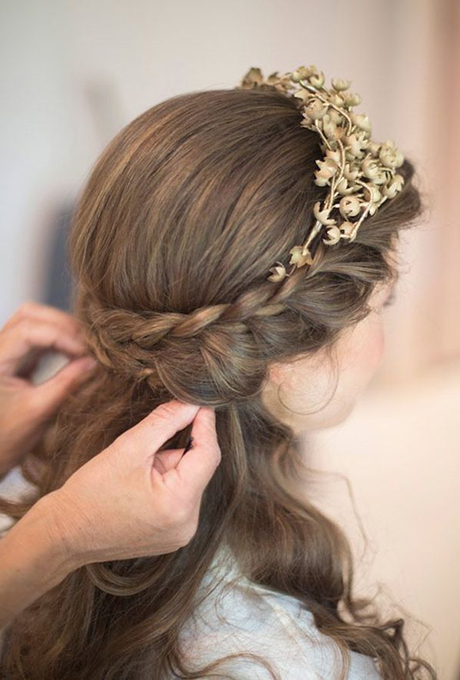 Customize your hairstyle by adding a dainty flower to the crown matching to flowers of your bouquet. This style, in particular, is the combination of French braid with fishtail hanging braid. The front portion of the hair is designed in French style while rest of the hair are tied into a fishtail, which looks worth carrying. If you want to keep your style soft and simple, then this would be a right choice for you. Yes! This hairstyle carries a combination of loose braids with the hair loosely tied into a side ponytail. 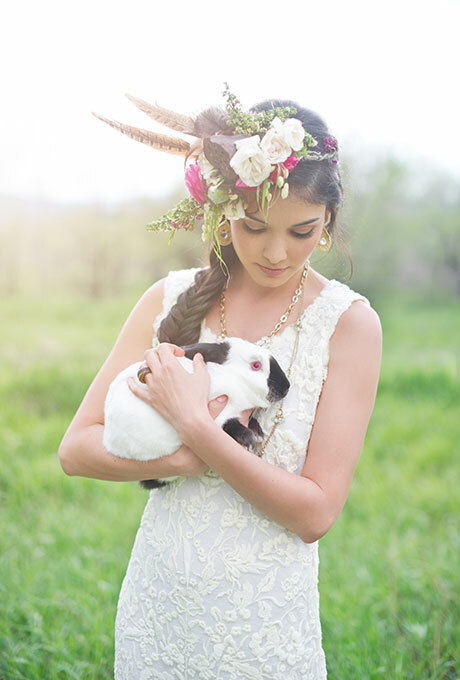 A great bun with flower crown topping is one the great wedding hairstyles every girl ever wanted. As fascinating as the characters of a fairytale this style carry a gorgeous braid with a volumized hair bun with a hint of dainty flowers. What could be the best replacement for a nice, gilded tiara than this hairstyle? Carrying a double braided band over the front of your hair makes this style more regal and royal than any. 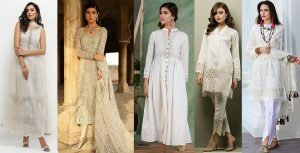 If you want yourself a classic and elegant look on your wedding day, then this style is the perfect choice for you. As this hair bun has twisted tendrils tucked into an up, do use your braids as a baseline to tuck in your curls. Achieving a pretty hairstyle was never easier before a nice waterfall braid. It gives your hair that soft and flowing appearance. It gives the bride a gorgeous outlook as she walks down the aisle in this hair style with braid draping low on her one side. If you want yourself, a fine, sophisticated wedding day hair up does then wearing a classic chignon would be best with the multiple braids. Tied with special care these braids do not look messy at all yet look extremely trendy and alluring. Simplicity is the queen of beauty; this saying is as true as the elegance of this sweet and nice braided headband that looks great with any white wedding apparel especially with the exquisite headpiece of the bride. Cool wispy hair locks coupled with the gorgeous crown with a flower is a dream hairstyle carrying various braids within one single braid. 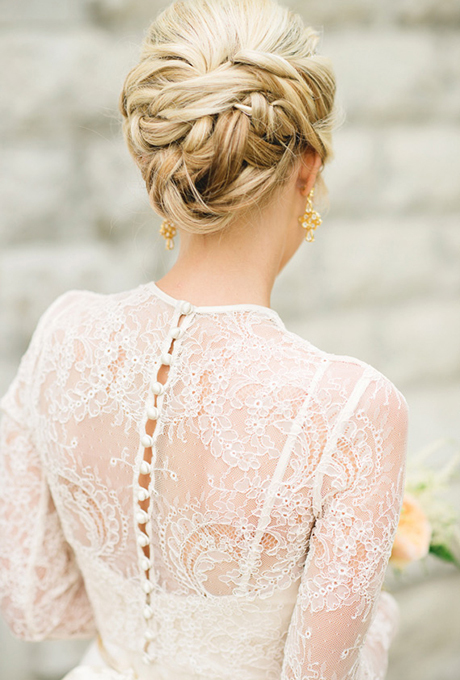 This style has all the messy touch that most of the girls love to carry with their wedding dress. 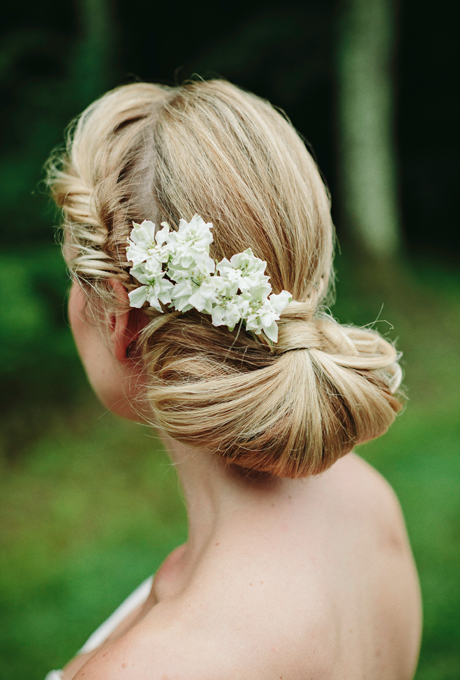 Loosely twisted curls with tendrils in a pleasant airy arrangement are all that makes this style super gorgeous. 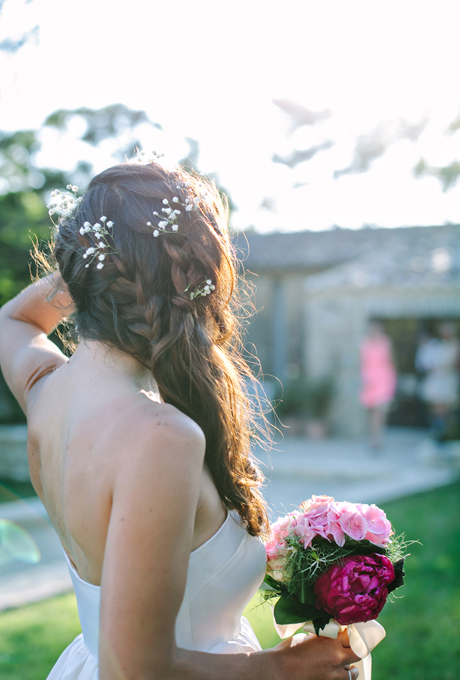 Bearing delicate flower over the tendrils looks simply alluring on every bride. 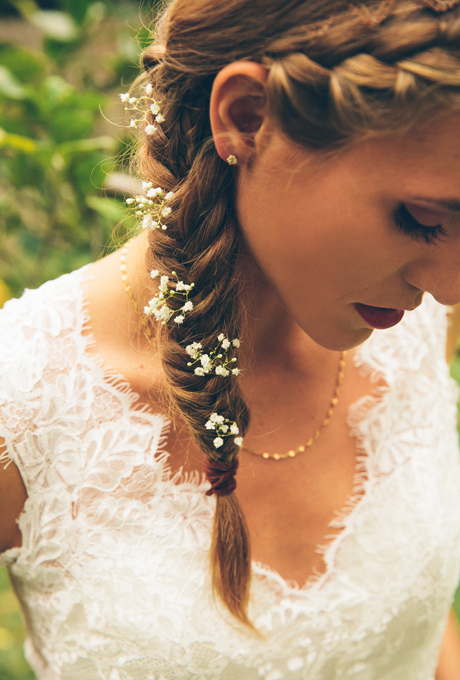 An amazing way to light up your outlook is to make your side braid stand out with light, loose curls, and blooms of dainty flowers. It gives you a romantic finish in a fascinating style. 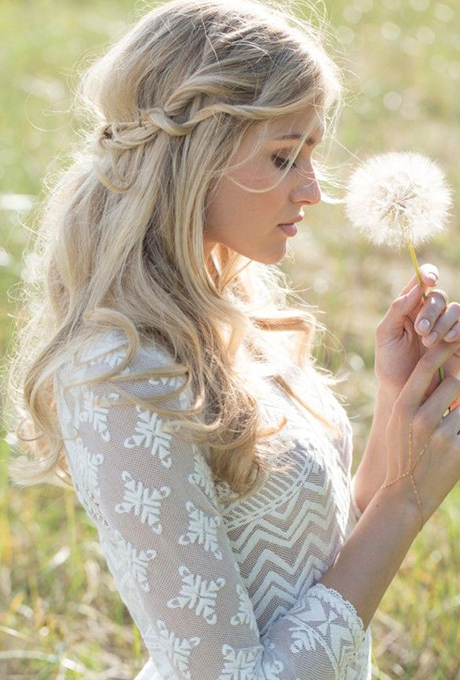 Outdoor weddings need a special care with the hair styling. 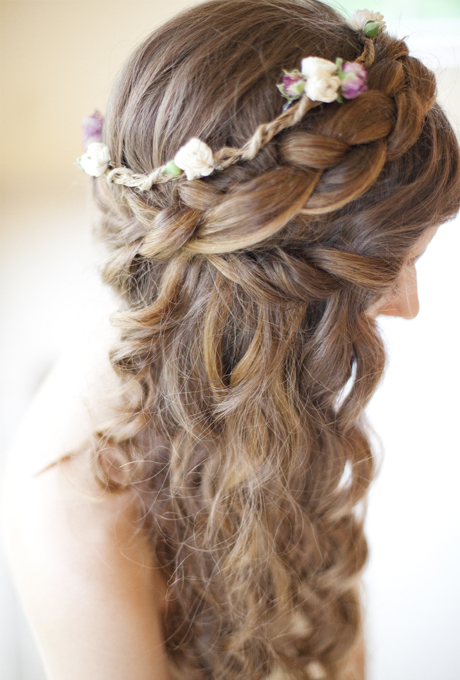 So a fuss-French braid would be ideal to carry a flower crown moreover make it look more fabulous. It is such a neat braided style with a fine fishtail braid decorated with pretty flowers and feathers that grab everyone’s attention. If you have silky straight hair, then a simple hair updo be great by simply having a double layered crown wrapping around the half of your head. Keeping the rest of your hair falling freely will look great. Another great style of hair bun adorned with some braids and plaits. This bun not only looks exquisite but also give your hair more volume. It’s again a half hair up do with both the braided crown combined with a twisted curl. 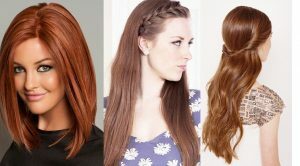 To add more style simply keep the balance between the two either keep the braid thick with a slim twist or vice versa. This wedding hairstyle is considered as one of the modern updos as they carry a fan bun with a fishtail braid giving your style a perfect elegant outlook that no one would want to miss.